Novak Djokovic kept his winning streak and perfect season alive today. Djokovic defeated Rafael Nadal in the final of the Sony Ericsson Open 4-6, 6-3, 7-6 to win his second title in Miami and his fourth consecutive of the season. It was the second week in a row that Nadal and Djokovic, world number one and two respectively, were meeting in a Masters 1000 final. The last time the top two players clashed for the title at this tournament in1995, number two Andre Agassi beat number one Pete Sampras in a third set tiebreaker. With a backhand up the line pass for a winner on his second break point opportunity, Nadal obtained a 2-1 advantage. It was the first time, Djokovic had dropped serve this tournament. After going down double break point, Nadal found the equalizer. The Spaniard survived another break point before consolidating for 3-1. Then, Nadal captured a second break for 4-1. The Spaniard salvaged another break point before widening his lead to 5-1. Nadal dropped serve trying to close out the set the first time around. But, despite difficulties, on his second attempt Nadal banked the set. After wasting multiple break points in the initial set, Djokovic aided by errors from Nadal seized the break for 2-0 in the second. Subsequent to wiping out a break point, Djokovic consolidated for 3-0 when Nadal’s slice backhand found the net. Djokovic pressured Nadal on serve while having an easier time himself. At 40-0, Djokovic sent a beautiful lob for a winner to stretch his gap to 4-1. Ultimately, with an ace on triple set point, Djokovic threw the gauntlet for a deciding set. The opening game of the third, Nadal overcame love-30 to hold. Serving at 1-2, Djokovic battled a similar predicament and got to 2 all. As the set progressed, despite a few 15-30 or 0-30 games, neither manufactured a break point. Fittingly, the championship was settled by a tiebreaker. The first four points of the tiebreaker, neither competitor maintained serve. When Nadal double faulted, Djokovic had a mini-break at 3-2. With Nadal’s next two strokes sailing wide, Djokovic had a 5-2 cushion. Following, Djokovic struck a forehand winner down the line for 6-2 and four championship points. Although Nadal won the next two points, on his third opportunity, Djokovic connected on forehand winner to pocket the trophy. 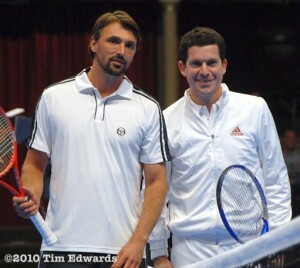 Tim Henman and Goran Ivanisevic faced each other at the Royal Albert Hall in London last night for the first time since their epic semi-final at Wimbledon in 2001. Ivanisevic broke the hearts of the British public by beating Henman in a thrilling five set match spread across three days due to the unpredictable British weather. I clearly remember listening to the commentary secretly during lessons at my school in North London on my vintage Sony Walkman, nerves on edge. Arguably, this was Henman’s most promising opportunity to be the first British man since Fred Perry to lift the Wimbledon crown. With a certain American, Pete Sampras, knocked out in the fourth round by none other than recent ATP Tour Finals champion, Roger Federer, the path seemed clear or so we thought. However, the stars were shining favourably on the charismatic Croat, who famously ate at the same table at the same restaurant every night during the Wimbledon fortnight. En route to his well deserved Wimbledon title, the pinnacle of any professional tennis player’s career, Ivanisevic won back the heart of the British crowd in his fairytale win against Aussie, Pat Rafter. Ranked world number 125 due to a recurring shoulder injury, Ivanisevic reached the final as a wild card entry and previously had three tough Wimbledon final losses to Andre Agassi in 1992 and Pete Sampras in 1994 and 1998. Yet, the changeable Croat with dual personalities is back. And what a comeback it has been for the 39-year-old. A regular on the seniors tour, Ivanisevic has won two titles in Barcelona and Knokke this season and recorded his fastest ever serve this year. He was one of the many players who encouraged Henman out of retirement to join legends such as Stefen Edberg, John McEnroe and Britain’s own, Greg Rusedski on the ATP Champions Tour in a more jovial yet competitive atmosphere. The players certainly didn’t disappoint the animated crowd last night. In fact, with the pressure off, they produced an outstanding level of tennis, with Ivanisevic serving as well as I’d ever witnessed, winning the first set 6-4. Indeed, Henman said in the post match press conference that no one had ever served as well against him in his entire career in that first set. Heady praise for the Croat who revealed he is serving faster than ever before with the “new technology” of rackets these days. With “good” Goran serving on all cylinders, this could have been a baptism of fire on the fast indoor court for Henman, only in his second match out of retirement. But, the Brit held his nerve well and showed many glimpses of his former glory, with great net play and feel around the court, winning the second set 7-5 and bringing the match to an exciting deciding Championship tiebreak. Despite the hecklings of the old Tim faithful, Goran served his way to the match with an 11-9 victory in the Champions’ Tie-Break, looking impressively sharp on his backhand returns too. Well, last night Goran, you were quite simply brilliant. In the last two years, Roger Federer’s tennis obituary has been written more than once. In fact, the notion of the great one’s eminent demise has crossed this writer’s mind on a few occasions only to be refuted. Since his victory in Melbourne, Federer has hit a speed bump from which he has yet to recover. Thus, rumors again are rampid as to the Swiss genius being put out to pasture. Unequivocally, the fear factor which Federer previously instilled in his opponents pre-match has waned. Yet, to deduce that his career is at its conclusion is a tad premature. Tennis followers are accustomed to Federer being a sure thing especially at the majors. With a total of 32 titles from 2004 thru 2007 and double digit trophies three of those years, Federer has been brilliance personified. In 2004, the stellar Swiss was perfect in finals, 11-0. Moreover, three of the fore mentioned years, Federer prevailed at three of the four majors. During that four year span, the ‘Federer Express’ was detained only twenty three times and relinquished at the most matches eight matches in a single season. Even at his peak, Pete Sampras garnered double figure titles, 10, only one time in 1994 and obtained maximally two majors in a calendar year. Arguably, 2008 was the best year to date for Federer’s archrival, Rafael Nadal. Along with Olympics gold, the Spaniard claimed two majors in that cycle. Considering Federer is almost 29 and Nadal 24 with his best years probably ahead of him, the comparison may be somewhat distorted. Yet, this underscores further the reason that fans expect excellence from Federer. Before 2008, with the exception of Nadal, Federer vanquished a lot of his competitors in the locker room. It was the 2008 Australian Open semifinals which marked Federer’s transition to the land of mortals. With Novak Djokovic halting Federer at that stage, it signaled to other adversaries that they had a prayer. Although Federer’s languid movement, which could be ascribed to mononucleosis, contributed largely to his defeat. The illness exposed a layer of vulnerability from which Federer had difficulty recovering the remainder of the year. In some respects, this year seems a flashback to 2008 with the express difference that Federer’s counterparts are upstaging him even earlier at the majors; something unseen previously. Why the transformation? Confidence. While Robin Soderling’s victory over Federer at an exhibition tournament in Abu Dhabi this past February may have been categorized by some as insignificant. In hindsight, it proved not to be trivial. That win cultivated in Soderling belief for their next meeting. A few weeks ago at the French Open, Soderling had his initial triumph over Federer after 13 attempts. 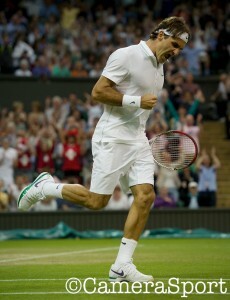 Moreover, the encounter was historic as Soderling terminated Federer’s extraordinary streak of major semifinals at 23. Another example is Tomas Berdych. After eight successive takedowns by Federer, the mentally fragile Berdych bested his nemesis in Miami this year. Then, in the Wimbledon quarterfinals, Berdych went on to replicate that feat. Later, at the post match press conference, Federer revealed that a stiff back and a leg injury which first surfaced in Halle were in part to blame for his failure. Indeed, there were echoes of Australia 2008 at Wimbledon this year. Federer just seemed a step slower than his opponent. Seldom would one associate the word mediocre with a Federer stroke, but it crept up to mind in watching his backhand. Moreover, the sting had slipped off the forehand side. Consequently, the rest of Federer’s game could not coalesce. In spite of the injuries, considering the result in Paris, the question lingers whether with a fully fit Federer, the outcome would have altered. Following the French Open, Federer’s ranking dropped to number two. After Wimbledon, it dipped to number three, his lowest since November of 2003. As the defending Wimbledon champion, Roger Federer has been given the top seed despite relinquishing the number one ranking to Rafael Nadal earlier this month. Federer will attempt to capture his seventh crown to equalize Pete Sampras’ record at the All England Club. After injury prevented him from defending his 2008 title, a salubrious Nadal is seeking his second back to back French Open and Wimbledon trophies. However, each man’s section is filled with rivals capable of tripping him prior to the finals. Here’s a look at the draw. After his historic string of consecutive semifinals was broken at the French Open, Federer had his tight grip on the title in Halle loosen by Lleyton Hewitt. Since prevailing in Australia, Federer has fallen to multiple adversaries whom he has owned and has yet to claim another title. In light of Federer’s vulnerability, it’s perhaps Andy Roddick’s opportunity to avenge his three previous Wimbledon final defeats by knocking Federer out in the semifinals. Beforehand though, Federer could have stiff competition in the round of 16 from French Open semifinalist Jurgen Melzer and in the quarterfinals from either Thomas Berdych or Nikolay Davydenko. But, with the latter just rejoining the tour after nursing an injury for several months, he may be less of a factor. Roddick may have some trouble of his own to contend with. The American could see Marin Cilic or Phillip Kohlschreiber in the round of 16. Kohlschreiber, the 29th seed, has taken down a few big names in his career which makes him dangerous. In the quarterfinals, Roddick is projected to meet Novak Djokovic. 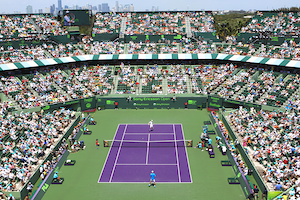 Djokovic has a tricky first round match against Oliver Rochus to whom he loss in Miami. In addition, Djokovic has a potential fourth round encounter with Hewitt. Djokovic’s game has been suffering of late which means that Hewitt has a good shot at reaching the quarterfinals in which case Roddick would be the outright favorite. In the bottom half of the draw, Nadal could battle big server John Isner in the fourth round. Isner has a game which translates well to grass and could bother the Spaniard. Then, the world number one has a possible clash with French Open finalist Robin Soderling in the quarterfinals. Considering their contentious five set, two day third round encounter in 2007 and with the evolution of Soderling’s game if these two collide, it will be an intriguing match. With an unbeaten record and a historic three Masters clay titles leading up to Paris, victory seemed a mere formality for Rafael Nadal at the French Open. Still, with Robin Soderling, the only rival to defeat Nadal at that venue as his finals’ opponent, an interesting twist was added to the plot. Irrespective of the challenger, Nadal demonstrated that he is the master on this surface. The Spaniard triumphed 6-4,6-2,6-4 to claim his fifth “Coupe des Mousquetaries” and recapture the number one ranking. Soderling commenced the first set with a couple of unfettered games. Then, with a forehand down the line error by Nadal had break point. However, Nadal got to deuce when Soderling’s backhand traveled out of play. With Soderling donating two forehand mistakes, Nadal equalized the set at 2 all. Promptly, when Soderling made another forehand error, Nadal had his initial break point. Despite Soderling dismissing one, Nadal obtained a second and capitalized with a backhand crosscourt pass for winner. Quickly, Nadal consolidated to widen his advantage to 4-2. In the next game, Soderling double faulted on game point resulting in deuce and later gave Nadal two additional opportunities to break. Yet, the Swede maintained his composure to pull off the game and remain one break down. When Nadal himself double faulted, Soderling had break point. But, on a forehand miscue by Soderling, Nadal rubbed out that previous error. A second break point came along after Soderling crushed a second serve return and Nadal was unable to deal with the subsequent shot. Yet, with Soderling gifting another error, Nadal won the point. Thereafter, Nadal secured the game and eventually seized the set 6-4. After Soderling’s uncomplicated game to open the second set, on an errant forehand by Nadal, the Swede had double break point. With an ace and a botched backhand by Soderling, Nadal reached deuce. Soderling manufactured two more opportunities. Nevertheless, each was snuffed out by Nadal to tie the set at 1. Soderling short memory helped as he held at love right after. Nonetheless, Soderling’s next time out, Nadal connected on a couple of winners for triple break point. When the Swede misfired with the forehand up the line, Nadal broke for 3-2. Later, with a glut of mistakes, Soderling handed Nadal a double break lead. The Spaniard easily closed out the set at 6-2. Unlike last year, for Soderling, the errors far exceeded the winners. Moreover, the serve, a potent part of Soderling’s game was being neutralized by Nadal’s excellent defense. Conversely, as the match progressed, Nadal cleaned up his game. Following an ace for game point, Soderling committed another error for deuce. With two consecutive forehands flubs by Soderling, Nadal bagged the break to begin the third set. By charging to net, Soderling forced Nadal to place a backhand pass out of play for his eight break point. Yet, by netting the backhand return, Soderling was now 0 for 8 on break points. Eventually, Nadal guarded serve for a 2-0 edge. The next couple of service games, Soderling comfortably held. When the Swede double faulted in the seventh game, Nadal had another break point. Still, Soderling dealt with the pressure and maintained serve for 3-4. But, Soderling was given no further looks at a break point by Nadal. As the mistakes flew off Soderling’s racket, Nadal promptly held the rest of the way to take the championship in straight sets.